This post is written by Kristian Campana, who has visited and documented more than 300 festivals on his blog OhioFestivals.net. When he isn’t writing about festivals, he is working jobs as an accountant and Italian translator, traveling with his wife and son or concocting some dish in the kitchen. Kristian resides in Oberlin. 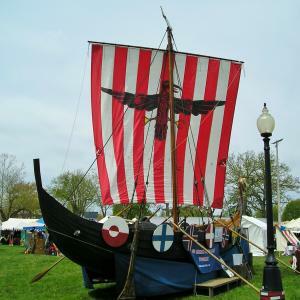 The Ashville Viking Festival is one of Ohio’s more fascinating festivals. But although the town is old enough to be the home of the world’s oldest traffic light, it obviously does not share any history with actual Vikings. This is a reference to the local school mascot. Still, once the festival sets up and the huge Viking ship is anchored, the park becomes unlike anything the town’s history has ever seen, pushing festival goers back in time to face Vikings, barbarians, Roman soldiers, elves and various other characters you would either find in world history or at a Renaissance Faire. And, as tough as the re-enactors may look, they are more than kind, greeting passersby in gruff voices, offering fighting tips to festival goers in foreign accents or pretending to amputate a spectator’s limb with a wink and a smile during a belly dance. And they’re pretty accommodating with photographs too, so don’t be shy! The festival is broken up in sections, making it easy to distinguish where one shops (Saxon Market), fights (King Harod’s Battlefield), or learns a bit about history (Grove of Heroes). 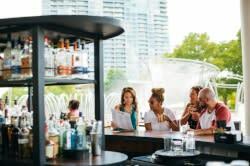 And there are also stages for some great dance and music entertainment as well as food halls that serve such delights as turkey legs, potato soup in a bread bowl and pork tenderloin. Just remember to bring a food item to the festival grounds, as it will be donated to the Ashville Food Pantry. Ashville is located 30 minutes south of Columbus.